Presentation Specialist, Deborah Shames, is on a mission to help women overcome their stage fright and use their voices to tell their stories. Deborah is convinced that when women hold themselves back and don’t share their ideas, or run for office or make a difference in an organization, everybody suffers. 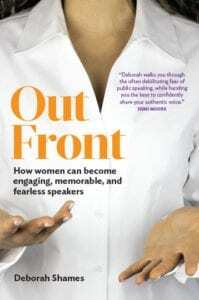 She wrote Out Front: How Women Can Become Engaging, Memorable and Fearless Speakers to give women practical tools to elevate their presentations from mediocre to life-changing. With a background as an award-winning director-producer in the entertainment industry, Deborah knows what professionals do to overcome performance anxiety. She adapted these techniques to overcome her own lack of confidence. She then co-founded Eloqui, and has established a track record for training thousands of women and men: executives, celebrities and professionals at all levels of their career. No one is a great speaker overnight. Deborah says the people she trains work as hard to become good speakers as they do at their professions. They understand how important it is to engage and resonate with the audience, and to create such concrete images that the audience can “see the movie in their heads.” She tells a story about a woman whose boss approached her following her presentation to ask her to teach him how to tell a story in such a compelling way. Have a clear intention of what you want to achieve, like proving to a client that your services are critical to their success and develop strong talking points to support it. Shut off the critical self-talk. Think about your audience and their responses rather than yourself. Learn to use an outline and stay nimble and resilient to what happens during your presentation. Begin in small, in low stress situations, like the PTA or a neighborhood watch meeting. Pause to celebrate your success before you move on. Seek out opportunities to speak often. If you only give a speech every 3 months or so, you’ll build up a lot of anxiety and negative self-talk. Take on a role for the presentation, like a seasoned veteran of your profession or a facilitator who invites participation and exchange of ideas. There are a lot more tools in Deborah’s took kit. She warns that women try to be perfectionists and don’t feel comfortable unless everything is written out and memorized. However, the statistics show that 80% of our communication is non-verbal. If we’re only delivering what we’ve memorized, how can we react to our audience with the appropriate visual cues to achieve our presentation goal? Check out Deborah’s website, OutFront.biz, to buy her book, participate in her blog or watch videos and to contact Deborah directly. She welcomes your questions and promises to answer them. Then listen to this interview for more insights into why Deborah and Dr. Nancy think it’s crucial for women to make their voices heard and how we can create maximum success.